Even if we have temporarily left the Brunei Gallery’s occupied space, this by no means signals the end of our movement here at SOAS and beyond. Indeed, to keep the momentum up and be ready to start again in January with a bang, we have decided to hold one last meeting before the Xmas break TOMORROW (Thursday 16th) at 4pm in the SOAS JCR. We are inviting all the occupiers, their supporters, all students, staff, members of the public, and all those who want to take part in the future steps of our struggle to come along and bring ideas, projects and visions for our actions in the new year. Soon we will also be posting on here videos from Monday’s beautiful Occupation Leaving Rally, as well as infos about any future events. So watch this space! After nearly three weeks in the Brunei Suite, we have decided that the SOAS occupation has almost reached the end of its current stage. During our time in occupation, the political landscape in Britain has changed dramatically. Our occupation has triggered a national wave of student occupations that have been successful in building a united student movement against fees, cuts and the abolition of EMA. At SOAS, we have gained the support of a huge number of staff and students, and created a strong sense of a community committed to working together on the issues that face us all. Lectures, discussions and entertainment have been widely attended and have made the occupation a viable space for action and learning. This occupation has shown itself to be a legitimate form of protest that is both effective and constructive. Management has in effect recognised this by failing to enforce a misguided school policy. Yesterday’s vote, in which the government’s majority was reduced by three quarters, reflects the crisis that we have contributed to creating for this government. The vote signals the beginning of our struggle, not the end. We will push on to campaign for an open, equal and diverse education system in the same spirit as has been the nature of the occupation so far. Open and inclusive meetings, actions and protests, demanding an engaged and vibrant education for everyone, are under way. We encourage students and staff to inaugurate mass departmental/faculty meetings to discuss our education together, and to join with the future activities of the occupiers. Come along and share your experiences, show your support, and prepare for the next step! We, the undersigned members of staff at SOAS, wish to express our strong support for SOAS students’ peaceful direct action against the planned cuts to the higher education budget, increases in tuition fees and the abolition of EMA (Education Maintenance Allowance). These policies, together with proposals that effectively limit the number of overseas students, are highly damaging to the future of higher education in the UK. They will contribute to already rampant social and economic inequalities and undermine prospects for a more favourable response to the current economic, and potentially social, crisis. Instead of this destructive agenda, a growing, more egalitarian and internationally open higher education sector should be an absolute priority. Not only can this be financed, but dedicated public investment into higher education is central to an enlightened and far-sighted response to the current economic crisis. We urge the School to support our students’ protests, and the SOAS Director and Vice-Chancellor of the University of London to express stringent and unequivocal opposition to the current government’s plans for higher education. See signatures in the “Comments” section. Wednesday Events: The Big SOAS Teach Out! 9-11am: St.Pancras International Station, in front of Pain Quotidien – Trevor Marchant is holding his lecture on The importance of Vocational Education and Craft Training in Africa and the Middle East. 10-11am: Meet on SOAS steps for a lecture by Laleh Khalili in the British Museum. Followed at 11am by a lecture by Whitney Cox about “Why should anyone study Sanskrit?” highlighting the importance of one of our courses that might be cut next year… again, in the British Museum! 12.30pm: Meet outside Birkbeck for mass school-sweep around Bloomsbury area. Organised by UCL & UCU. Come and make some noise! 1.30-2.30pm: Meet on SOAS steps for a lecture by Phil Clark “African Transitions: Why Democracy Means More than Internationally Sanctioned Elections” in Russel Square Tube Station. 2.30pm: meet on SOAS steps for a lecture by Polly Pallister-Wilkins and Giovanni Cozzi in a bank branch near Russel Square (tba)! 3pm: Meet on SOAS steps to take over tube carriages for mini-lectures and shout-outs about the state of Higher Education! 4.30pm: Meet on SOAS steps to go to Euston Station for the MASSIVE SYMBOLIC LECTURE by all and for all, for free and universal education. We will be joined by UCL, LSE, and Kings Students for this one. 5pm: MASSIVE SYMBOLIC LECTURE AT EUSTON STATION! YAYYYYYY! 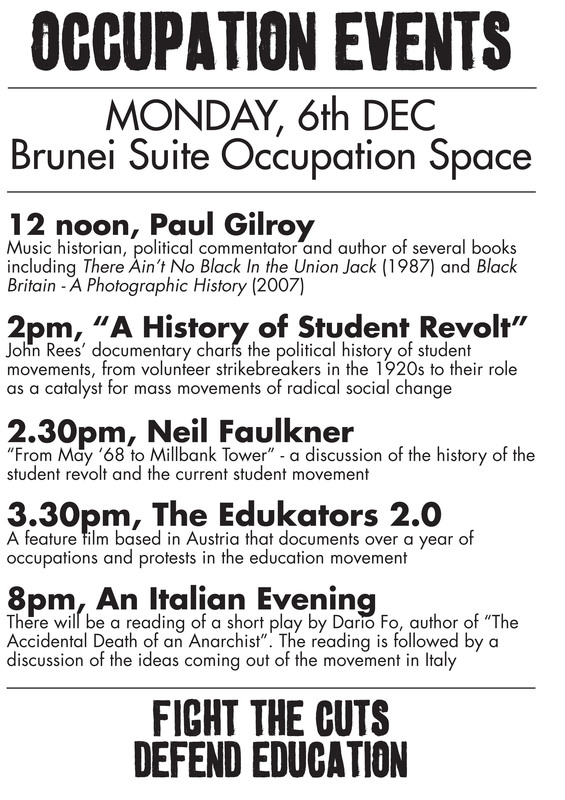 SOAS Occupation proudly present a teach-in afternoon this Tuesday 7th December. Many thanks to all the lecturers who have given their time and effort to put this on. Bring on the Free University! 4:30pm-5pm – Stephanie Blankenburg “Why we are NOT (all) “drowning in a sea of debt”.